Just about every championship baseball team has a valuable utility player to fill nearly every position. 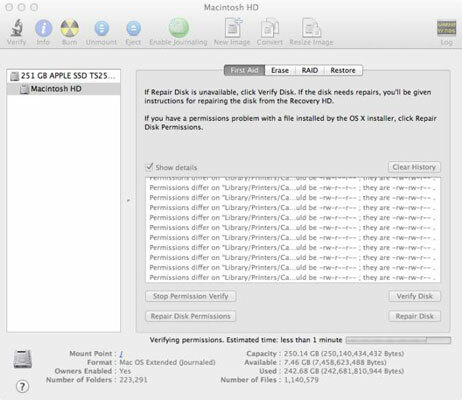 The versatile Disk Utility tool on your Mac serves this purpose for all things hard drive–related and many things optical drive–related. At a glance, it gives you a summary of your drives, including disk capacity, available space, and number of files and folders. If you suspect that your hard drive is actually damaged (even a reboot doesn’t seem to do much good), run Verify Disk to uncover any errors. If you find any, you must be an administrator to authorize a repair. You can’t repair (or even test) write-protected disks and nonrecordable CDs and DVDs. The most important restriction is this: Although you can use Disk Utility to test the drive you’re using (and, as you’ve seen, fix permissions), you can’t repair it until you boot from another disc. This disc is most likely your Mac OS X installation CD or DVD, which you will need if you’re using an older version of OS X.